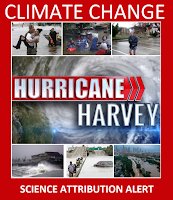 Storms are complex phenomena but we can say with a good degree of certainty that Hurricane Harvey and other extreme weather events are exacerbated by global warming. Hurricane Harvey is the most powerful hurricane to hit Texas in more than half a century. It smashed into the coast of Texas on Friday as a Category 4 hurricane. It then dumped over a meter of rain submerging streets, homes and vehicles. Thousands of people were stranded on rooftops in scenes reminiscent of Hurricane Katrina. In addition to widespread property damage Harvey is known to have killed at least 14 people and almost seven million people have been affected. We cannot understand the physics of Hurricane Harvey in isolation nor can we fully appreciate the costs of climate change by looking at individual extreme weather events. Only a few years ago the North East was dealing with the cataclysmic flooding of Hurricane Sandy that caused $75 billion in damage. At $108 billion Katrina was the costliest storm in US history. Katrina ravaged Louisiana and nearby states, along with Cuba and the Bahamas. As reported by Grist, "a preliminary and informal estimate by disaster economist Kevin Simmons of Austin College, the aggregate cost of damage and lost business associated with Hurricane Harvey will likely exceed Katrina. That means Harvey could ultimately cost between $150 billion and $200 billion, even more if the floodwaters significantly expand." We cannot afford to ignore the cost of global warming, sea level rise (ie flooding), and extreme weather. The number of lives lost and staggering property damage make climate change a priority issue for governments, civil society and scientists. 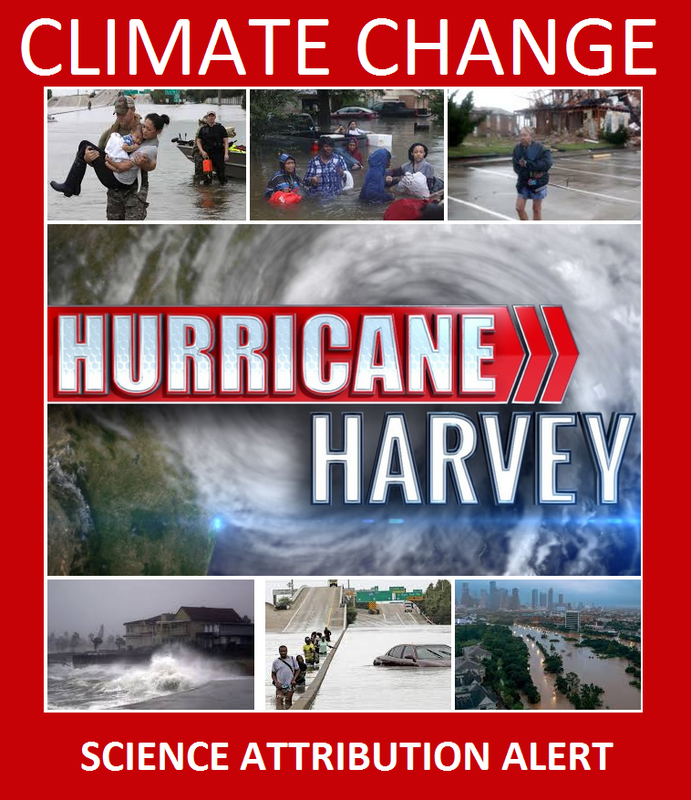 Harvey, Sandy and Katrina are all examples of hurricanes that are consistent with scientific predictions about global warming. While the hypothesized link between global warming and extreme weather has been around for many years scientists are increasingly able to elucidate data quantifying this relationship. The physical law known as the Clausius-Clapeyron equation states that as the atmosphere warms it holds more water. It is estimated that there is a 6.5 percent increase in the amount of moisture in the atmosphere for each degree Celsius increase in temperature. We also known that the oceans are warming (approximately 1.5 degrees warmer in the Gulf of Mexico) and this generates more energy and creates more water vapor. This in turn translates to more intense storms and bigger downpours. "This is the type of event [Hurricane Harvey], in terms of the extreme rainfall, that we would expect to see more of in a warming climate," Dr Friederike Otto from the University of Oxford told BBC News. "For the intensity of the rainfall (over Houston), it is very reasonable to assume there is a signal from climate change in that intensity." Warmer oceans also contribute to sea level rise through what is known as thermal expansion. Both storms and higher seas have contributed to an increase in fatalities and the amount of property damage associated with flooding. Climate change is driving an increase in the most extreme forms of extreme weather. According to James Elsner, a scientist who studies the relationship of hurricanes to climate factors at Florida State University, "under global warming, we should see stronger storms, especially the strongest ones." This general understanding is being buttressed by attribution science that relates climate change with specific events. Increasingly we are seeing data that lends weight to the connection between a warmer world and individual extreme weather events. While it is far from a mature discipline, the field of attribution science relating climate to weather has been growing for years. In 2013 scientists were beginning to pull together data that enabled them to attribute extreme weather to climate change. Scientists also observed causal connections between climate change and the the 2014 flooding in the UK. We are seeing a trend towards more intense storms and this is borne out in a review of extreme weather in 2015 and 2016. Hurricane Matthew received intense scrutiny and researchers found evidence that climate change also contributed to this storm. The degree to which extreme weather can be attributed to climate change may be as much as 30 percent. As reported by CBC News, Kevin Trenberth, a scientist in climate and global dynamics at the U.S. National Center for Atmospheric Research, shares this view. He suggests the data indicates that, "climate change effect total can be easily be up to about 30 percent". Chris Landsea, a researcher at the U.S. National Hurricane Center, says that climate models predict that big storms could get two to five percent stronger and produce 10 percent more intense rainfall by the end of the century. While we could debate the degree of impact it is hard to refute the reams of scientific data that support the relationship between climate change and extreme weather. We know with considerable certainty that a warming climate contributes to bigger storms and more rainfall. We also know that greenhouse gases are driving temperature increases. Climate change is one of the most studied phenomena in the world and decades of hot data point to a looming catastrophe. The same data indicates that unless we radically curtail the amount of GHGs we emit into the atmosphere extreme weather will get much worse.